FTC disclaimer: This post contains affiliate links where I earn a small percentage of a sale at no additional cost to you. Because of shipping times, if you want to send your favorite (or a random!) missionary who is overseas a package for Christmas, you better get the package ready soon. Don't know what to send? 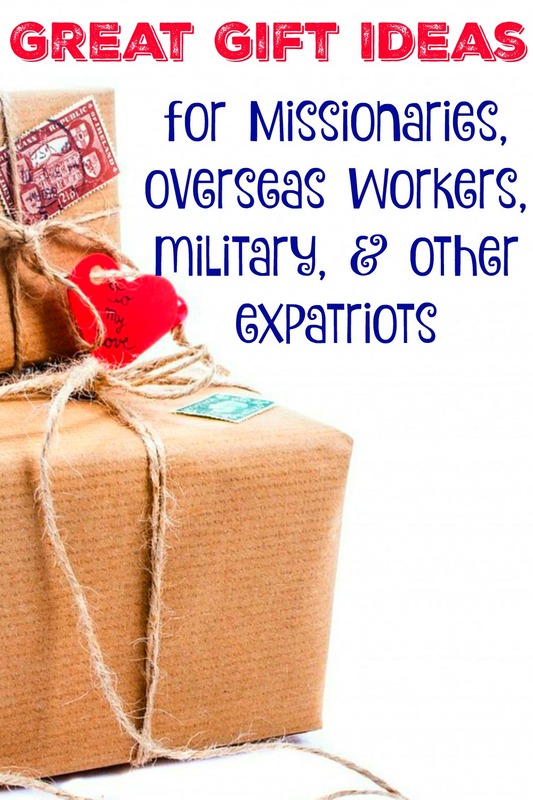 This is an adapted list of things friends of mine who are missionaries would LOVE to receive in a package from home. 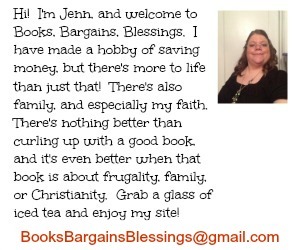 Some things are inexpensive and can't be bought overseas, but might be heavy and cost more to ship. But there are some things that are smaller and light weight that would be less expensive to mail. Amazon Gift cards -- most missionaries have a Kindle. Or they could download a new album. You can send a gift card in as little as $1, so don't think you have to spend a lot. If several people sent a small amount, they could get a new book. Paypal or Money -- send them some cash -- they may live in a place that sounds exotic to us, but they don't always have the resources to do something fun in their host country. You could even say "Take the kids to McDonalds for dinner" or "treat yourselves to a date night" or just tell them to do something fun. An Amazon gift card can be sent via e-mail (and is often much more secure than mailing a gift depending on the country.) This would allow them to chose a book that would help them minister. Ask what they might be in need of. Ziploc bags. Seriously. All sizes. You can't go wrong with Ziploc bags, and you can even use them as packing around other items. Activity or coloring books that teach use of American money, States, American History etc. A picture your child drew, or a note from your child, especially if s/he is the same age as one of the missionary's children. It is amazingly expensive to mail items overseas. Don't think you have to send something for the entire family, one small item can be amazingly encouraging to let them know they are remembered. When I visited with a missionary family, it was a whole family event to open a package, even if it was a birthday gift for one of the people. Another missionary group I visited always ate lunch together and everyone read their letters to the group, and often shared treats from packages. Your boxes, letters, and notes are very enjoyed and appreciated! What great ideas! Thank you - lists like this make it so much easier to support the missionaries in our church. Thanks Jamie! 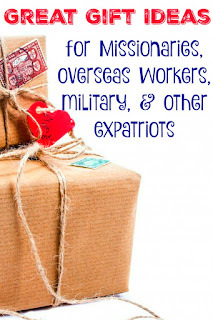 I know sometimes that people don't know what to send missionaries and I'm really hoping this list helps both those who send gifts as well those who are sent gifts this holiday season. :) When I visited friends who are missionaries, I took only three outfits for two weeks because my suitcases and carryon were packed with all kinds of stuff -- ranch dressing mix, Oreos, Pop Tarts, clothes for them, seasons of TV shows on DVDs. They let others know I was coming and that way people could ship stuff to them by just shipping it to me. :) It was fun to just put a suitcase in front of my friends and tell them to open it!